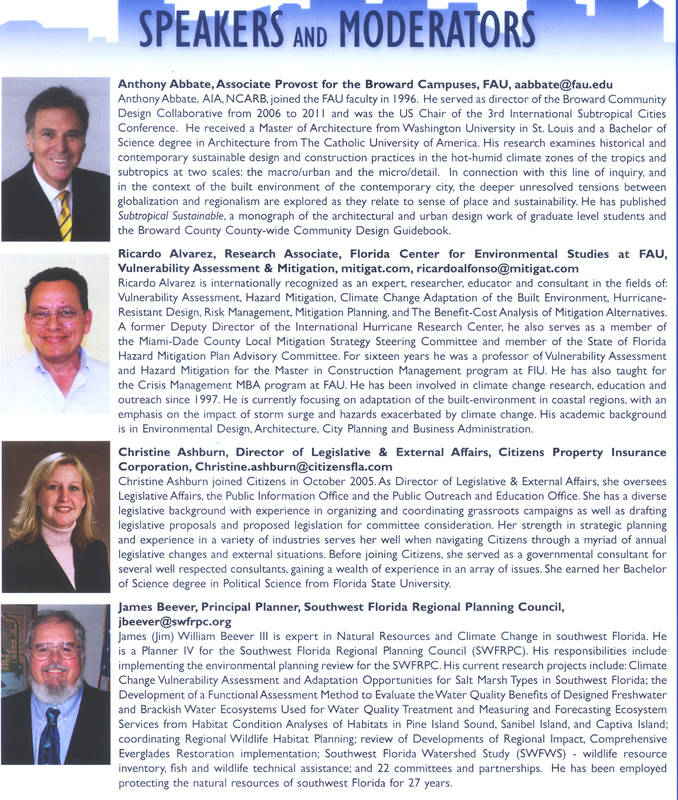 The Coastal Built Environment in Southeast Florida and Sea Level Rise: Prognosis for potential damage and needed change. 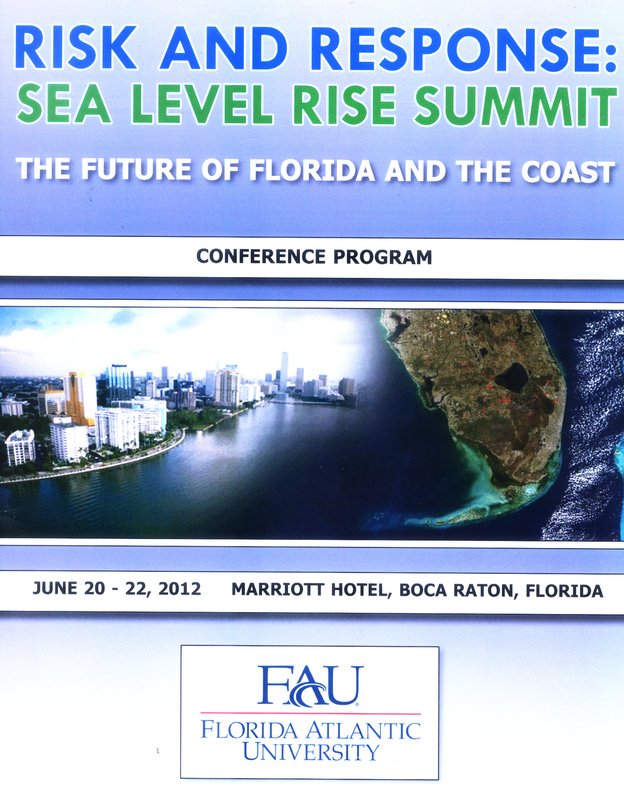 Organized by the Florida Center for Environmental Studies [CES] at Florida Atlantic University [FAU], and with support from several public and private agencies and institutions, an important conference – RISK AND RESPONSE: SEA LEVEL RISE SUMMIT: The Future of Florida and the Coast – took place on 20-22 June 2012 at the Marriott Hotel, Boca Raton, Florida. Truly an outstanding 2-1/2 day conference featuring: 1) An exhibition of more than 40 scientific posters covering an ample range of topics, from * Statement of the Problem; *Impacts on the Built Environment; * Economic Impacts; * Organizing for Climate Change through Partnerships; * Adaptation and Mitigation – Preparing for the Future; and * Education: Explaining the Problem, Sharing the Message. 2) Two wonderful and dynamic keynote speakers: Margaret Davidson, Director of NOAA Coastal Services Center, who delivered inspirational opening remarks on the topic of Vulnerability, Impacts, and Adaptation in Florida, and Michael E. Mann, published author and professor of Meteorology at Penn State University who spoke about his work linking global warming to greenhouse gas emissions, and the fallout of political attacks that ensued, which are documented in his book The Hockey Stick and the Climate Wars. 3) A total of seven working sessions where seven moderators and 32 panelists discussed, and presented views and research findings on a range of topics, while also involving the audience of more than 250 participants in lively Q&A and comments segments. I had the privilege of being invited to be a panelist in Session Four: Impacts on Built Environment: Urban Planning where we responded to the following question: How is urban infrastructure and housing, both existing and new development, adapting to increases in sea level? The session moderator was Anthony Abbate, Associate Provost for Broward Campuses and Professor, School of Architecture, Florida Atlantic University; and the panel consisted of: Daniel Williams, Rhonda Haag, Margo Moehring and Ricardo A. Alvarez. As a panelist I focused my remarks on the potential for damage to coastal buildings and infrastructure from the impact of storm surge, which is being exacerbated by sea level rise, and which in my view constitutes the dynamic and most visual evidence of sea level rise and the current threat it represents for our built-environment. 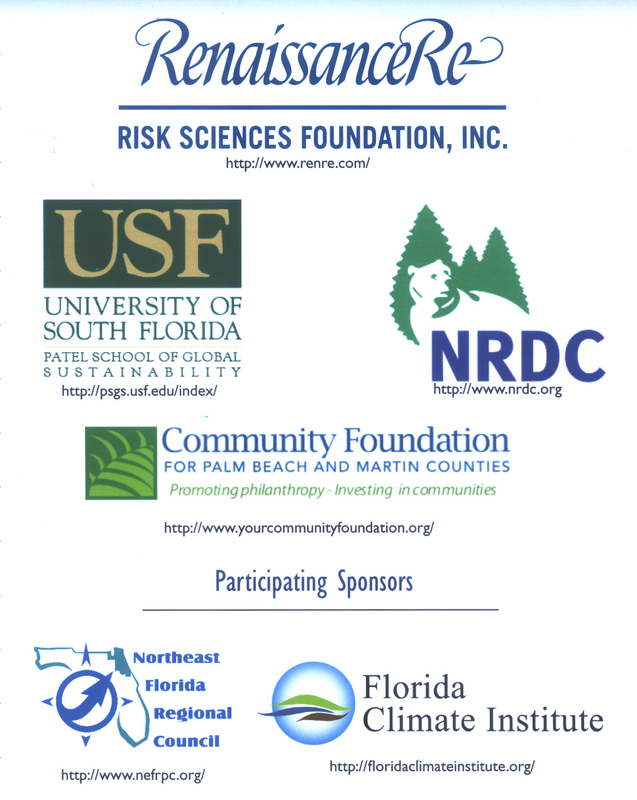 My presentation was based on notes from a paper in progress under the title of: The Coastal Built Environment in Southeast Florida and Sea Level Rise: Prognosis for potential damage and needed change. 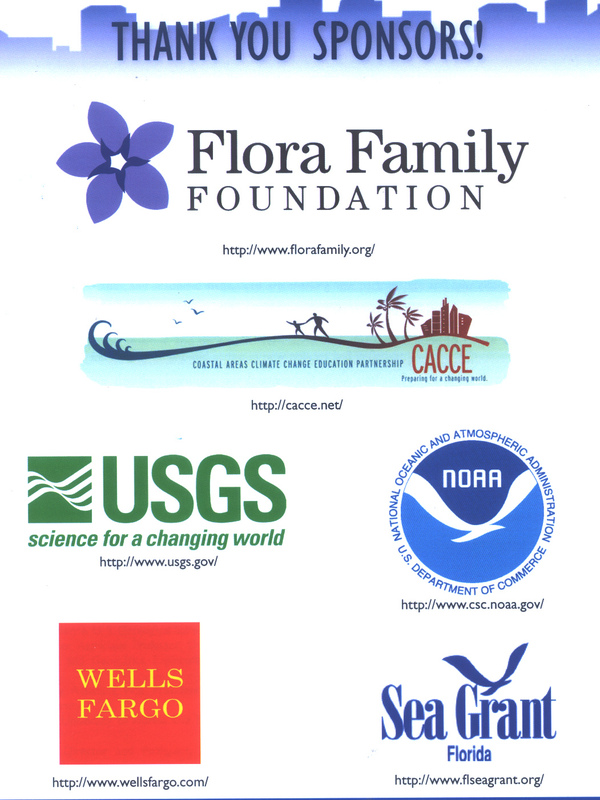 To view these notes go to the banner menu above and click on CONFERENCES-PRESENTATIONS, then select Panel Presentation: Sea Level Rise Summit 20-22 June 201. I have been involved in global change and sea level rise arena since 1997, and the specific topic of impacts to the built environment and the need for adaptation has been on the table in most of the numerous conferences and workshops I have attended over the years, but this specific SLR 2912 SUMMIT is the first time that this topic is directly addressed and discussed, both from the perspective of a problem that will grow worse over time in the future, and that of potential solutions and areas of additional research. In this regard I must say that our panel received immediate feedback during the Q&A segment that followed our presentations and discussions. At a personal level, I had twelve participants who approached me after the session had ended to ask additional questions, or to share ideas and comments regarding the specific topic of adaptation of the built environment. Also, I have continued to receive follow-up comments via email throughout this the week after the Summit. I submit this confirms: (1) How appropriate and on target was the inclussion of this specific topic in the program for the Summit, and (2) The high level of importance the public gives to this issue as reflected by the involvement of the participants who were a representative sample of the public at large. In closing I would like to emphasize we all must stay on this topic, which means we will need to engage in follow-up workshops and conferences, and in a continuous and vibrant dialog as we search for solutions and alternatives for the many facets of the problem. In this, we must maintain an open mind while we work toward solutions staying above the ‘noise’ of ‘nay-sayers’ claiming either there is nothing that can be done or that it isn’t happening. Godspeed to us all, let us roll-up our sleeves and tackle this head-on!